One way you can spend time with your children this week is by watching a movie with them. 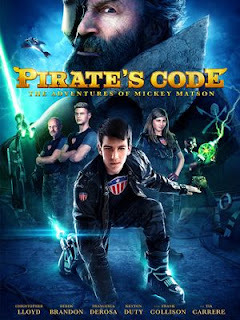 My family and I recently watched the newly-released-on-DVD movie, Pirates Code: The Adventures of Mickey Matson. In this follow up to Mickey Matson and the Copperhead Treasure, Mickey and his friends go up against the evil Admiral Ironsides and his gang of modern-day pirates. The pirates' new invention is a weapon of mass destruction that is meant to destroy every electronic device in existence. Mickey and his friends take on a mission to stop the pirates from their evil plans. NOTE: If you did not see the first movie, like us, you can still understand the story line of this one. This is not a faith-based movie, but is family-friendly and Dove approved. It is full of action and adventure, which really helped to keep the interest of our 12-year-old son, although it is not limited for an all-boy audience. You can purchase today from PURE/FLIX. Or, if you would like a chance to win a copy of this DVD, take a moment to fill out the form below. The DVD will be directly sent to the winner by FlyBy Promotions. Giveaway ends Saturday, June 20, 2015, at 8:00 p.m. CST.